Accountable Care Organizations are becoming the new Black. There are some of us who recognize how befitting that metaphor is given that healthcare models seem to have a cyclical nature to them. Mostly they cycle between physicians heading out to be independent from healthcare organizations and then coming back under the umbrella once again. Has there really been any significant change in how we deliver healthcare over the past 50 years? I’ll give ACOs 10 years before the next best thing comes along. But, alas! 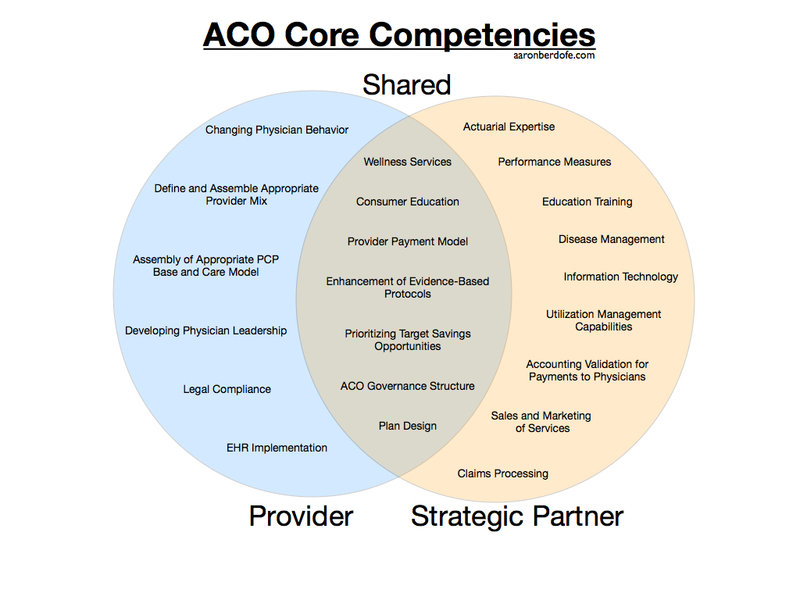 For those of us that deal with EHR implementations we will have clients in the meantime that want to achieve ACO status. How important are EHRs to ACOs? Necessary? Yes. A major contributor? No. Take a look at the 22 core competencies listed above in the diagram. The EHR implementation is 1 of those 22. How much did you or are you spending on your EHR implementation? Let’s say the rest of those competencies only cost 1/2 as much as your EHR implementation which have been known to cost millions of dollars (billions even!). Multiply that number by 22 to get the total cost of achieving ACO status. I know the numbers are arbitrary and there is some variance in the cost of the other competencies, but the point is that after you’ve implemented you’re EHR, you’re going to need at least a few million lying around to go after the ACO goal. Yikes! The point I’d like to make in this post is that despite the fervor over EHRs right now, they are not the last stop. Unfortunately, the costs of an EHR do not subside once it is implemented. We have not reached a point where EHRs are remarkably cheaper than they were before either in upfront purchase costs or maintenance costs. Therefore, how big will your operating budget be in the future if the EHR is only part (perhaps 1/22) of the whole picture? EHRs are being commoditized right now with the Meaningful Use requirements, but does this mean their price will come down soon in the future? The bulk of the EHR cost comes from all of the expensive people with specialized knowledge you need to put the EHR in and keep it up and running. EHRs need to go from being behemoths to being nimble creatures. ← The EHR Squeeze: How Much Can You Get?